We went to the college to judge the Botany student’s cooking contest. 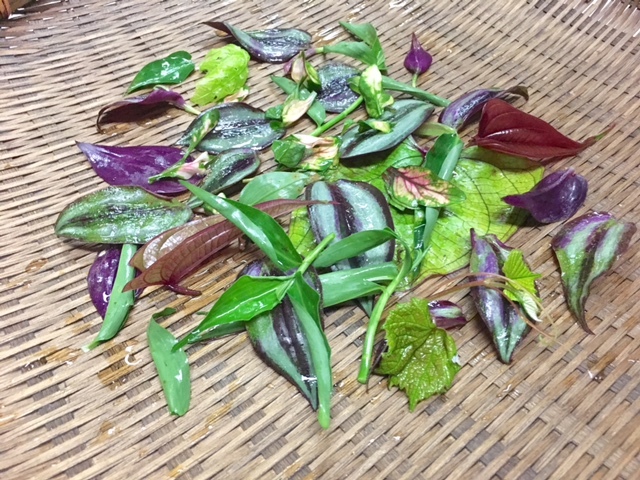 The students had to use one ingredient, a plant, called Tradescantia Zebrinae (Wandering Jew or Inch Plant) in their dish. There were appetizers, soups, salads, entrees and desserts, totaling over thirty dishes to judge. This plant is being tested and is known to treat fungal infections, having anti-cancer properties, being a coagulant of blood helping to heal cuts. After the judging was over, the professor took me to her medicinal garden. In the garden were things like Samoan yam leaves, honohono grass, noni leaves, Spanish needles, amaranth leaves, and so much more. I picked a few, brought ‘em to work and made this simple salad. This is a salad you might find at NOMA and Willows Inn on Lummi Island which was recently voted Number One restaurant in the US and where I just had dinner. This one just happens to be medicinally good for you in so many different areas.